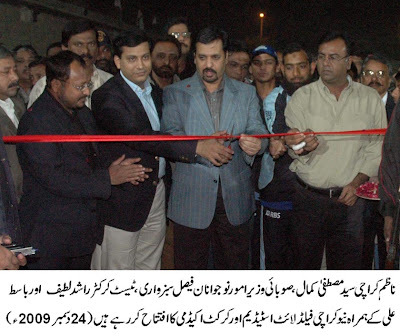 City Nazim Syed Mustafa Kamal inaugurated flood light stadium in North Karachi on Wednesday night. The stadium has been built by CGDK with a cost of Rs50million. Provincial Minister for Youth Affairs Faisal Sabzwari, DCO Karachi Javed Hanif Khan and large number of people attended the inaugural ceremony. Talking to media representatives on this occasion City Nazim said that during last four years more than 18 sports stadiums and 18 cricket academies have been established by city government in different parts of the city. Payment of salaries to members of town cricket team and their coaches will also start from 1st January 2009. City Government has so far completed 7 flood light stadiums in Karachi which have been opened for public. Nazim Karachi said that 2 country clubs in Baldia and Orangi Town, Sangam Cricket Ground and three astro turf hockey stadiums have also been completed while the football stadium will be inaugurated next week. All these grounds and stadiums will be handed over to prominent sports persons who would besides running their affairs also arrange for training of youths. He said that an indoor sports complex has also planned at one side of this ground which will be completed soon. Nazim Karachi said that by giving importance to sports and recreation facilities, City Government Karachi has set up new example for other district governments in Pakistan.